Since 1984, we have been assisting commercial facilities in meeting fire and safety codes throughout North America. International Fire-Shield, Inc. offers a variety of ON-SITE Services that include cleaning, flame retarding and certification services for your facility's public occupancy areas. Our Certified Technicians are available for large volume contracts or on an emergency basis for on-site fire retardant needs. We service your materials "on-site," quickly, economically and professionally without the down time of off-site service any time, day or night, seven days a week. 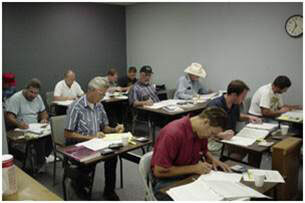 This two day course trains certified applicators how to evaluate, apply and maintain material compliance. Areas of instruction include flame retardant products, evaluations and monitoring followed by hands-on evaluations and applications. The course is available to organizations for in-house staff and independent contractors. Trained professionals from International Fire Shield will arrive on site to do a complete evaluation of miscellaneous flammable items to address compliance with the Life Safety Codes (interior finishes and decorative materials). Information will then be brought back to our offices for compilation of a detailed report and proposal to complete the necessary services to bring the facilities into compliance with the Life Safety Codes. The evaluations match applications for interior finishes and decorative materials with UL, ULC and ICC classified flame retardant coatings, paints, varnishes and thermal barriers. International Fire-Shield's monitoring program enables our client's access to track treatment and re-treatement records on all goods in all facilities. Certified applicators stamp completed applications with an invisible strategically located stamp. This stamp, visible only under our provided UV lights, can be examined annually by inspectors to identify items treated, date, product used, certified applicator, term and length of certification. On laundered items the stamp disperses indicating re-treatment is needed. On applications of paints and varnishes, our stamp is permanent until repainting. The stamp number refers back to the corresponding batch number at the manufacturing plant. FR (Fire Retardant) University is International Fire-Shield, Inc.’s in-house course for training Certified Applicators of our products. It is a cost-effective program to give you or your staff the knowledge to apply our products correctly, thereby ensuring code compliance, saving you time – and saving you money. For more information please go to our section on FR University.